I've said it before...this menu planning thing works. There are many times when I want to skip making dinner and buy some Taco Bell for the kiddies. Then I think of my menu plan, posted on my blog for all the world to see. And I persevere. 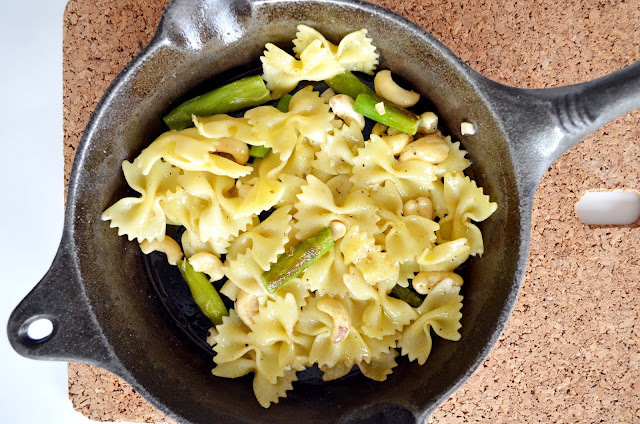 Monday's Quick Asparagus Pasta was actually quicker than going for Taco Bell. Nothing fancy, but I enjoyed it. One snag in the plan, though. I needed asparagus. Turns out that's the one thing they didn't have at the grocery store. Does that happen to you too? The one thing you want isn't available that day? Anyway, I bought frozen asparagus and then spent time worrying it wouldn't work well. But it was just fine. I also used cashews because the pine nuts called for in the recipe were just so expensive. Not sure the cashews were the best choice though. Maybe I should have sprung for the pine nuts. 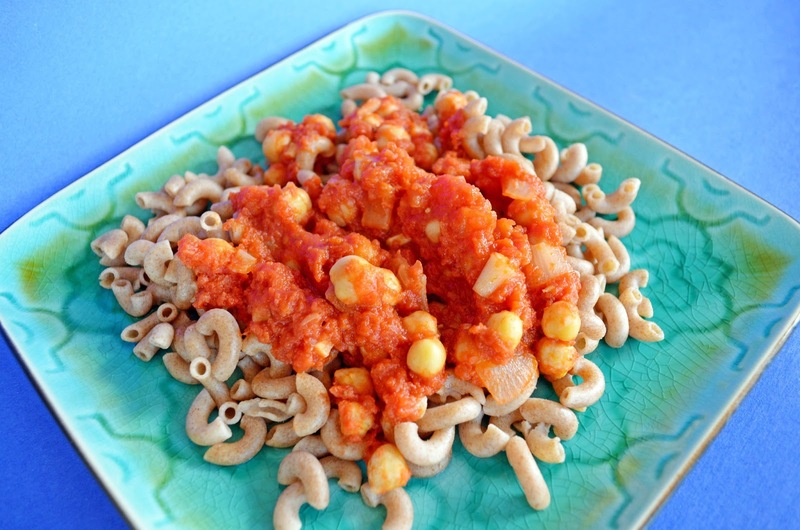 Tuesday was another easy meal...kamut elbow macaroni with a quick homemade tomato and chickpea sauce. Wednesday's meal might not look like much, but it was the most delicious of all...Sumptuous Shepherd's Stew. I guess the theme for the week (unintentionally) was simple meals, because Thursday's Chickpea and Rice Soup came together in a flash too. Friday take-out is becoming a bit of a pattern with us. That's what happens when you schedule Fridays as "TBD." We ordered from an Asian fusion restaurant...vegetable Cantonese chow mein, fried rice and tofu with mango. Delicious! On Saturday, my husband made the scheduled black bean burgers. 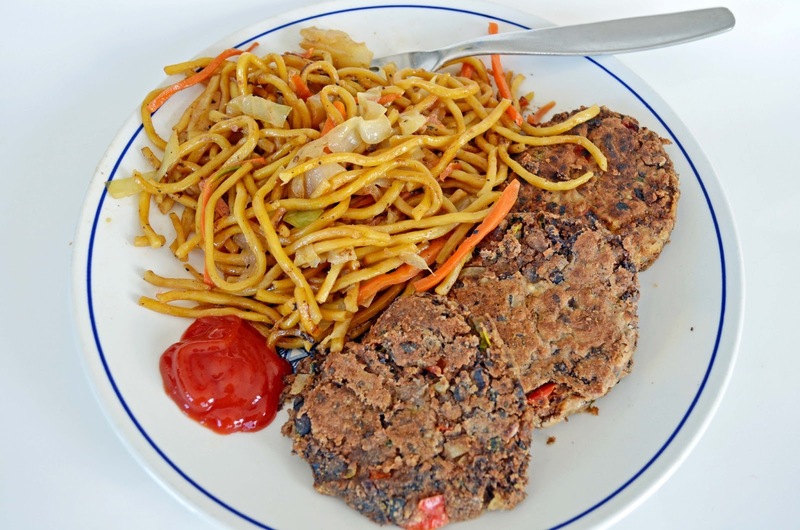 I had leftover burgers for lunch today, along with noodles mixed with veggie ham. I got the noodles at King's Cafe in Toronto in the frozen section. They are only $3.99 and you just have to re-heat them. Nice! Sunday's dinner remains to be seen. The husband's cooking...and picking the recipe. This was so good, I need to make it again. Visit this post to enter to win a copy of "Meatless," the beautiful new vegetarian cookbook from Martha Stewart Living. I want to come to your house this week for my meals! Off to check out your links. Everything looks so good and once again, such pretty dishes!! I love that you recap what you made... it always looks amazing! And yes, I'm finding the same thing with menu planning... holds me accountable. & the sad reality is, there are no replacements for pine nuts. Sigh. John and I are trying very hard to plan our meals because we buy wayyy too much Taco Bell (so gross) due to time restraints. So, this post is motivating to me. :) That shepherds stew looks GOOD! Taco Bell is sure tempting. I don't eat dairy anymore so no more 7-layer burritos for me. 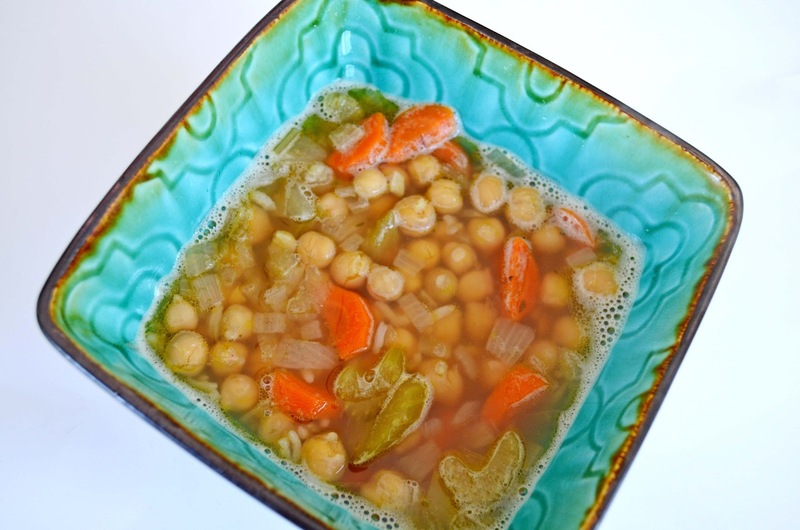 These are some quick, easy meals. 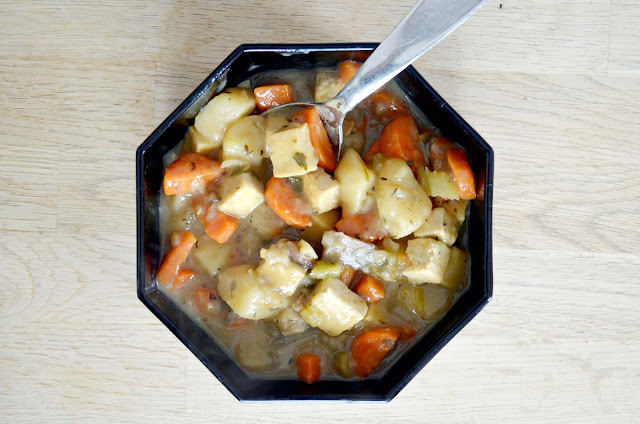 And the stew is well worth making...and not hard to do either. I have to emphasize that because I don't like to spend a long time in the kitchen! My stomach is rumbling just looking at all of this good food! That shepherd's stew looks soooo good.